So Spectrum FAL 3 has come and gone, and my weeks of planning worked out pretty well. 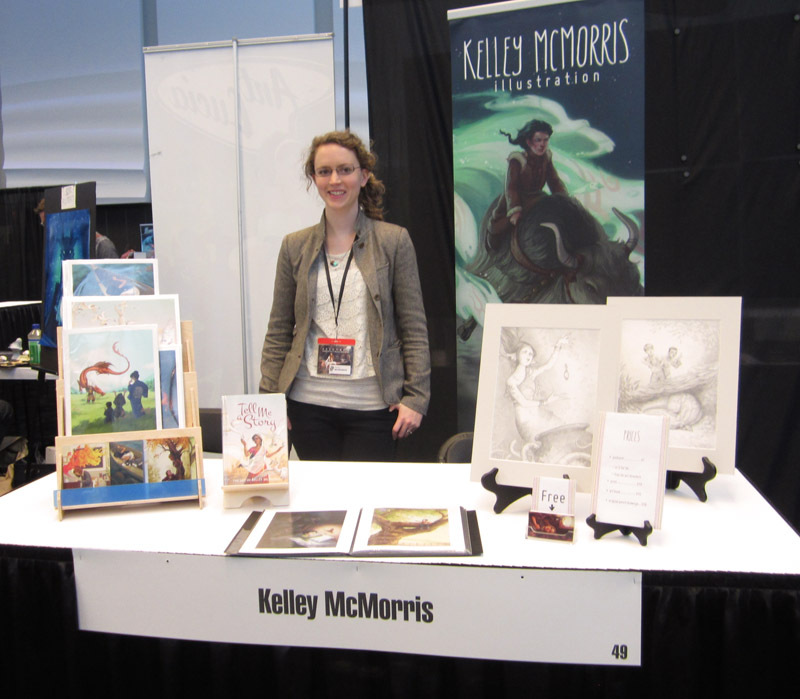 Thanks to everyone who stopped by my table to tell me that they read my blog! Hi guys! When a cute girl, a high schooler I think, got all giggly and twitterpated when she saw me, like I was some kind of celebrity. It's better with a booth buddy. 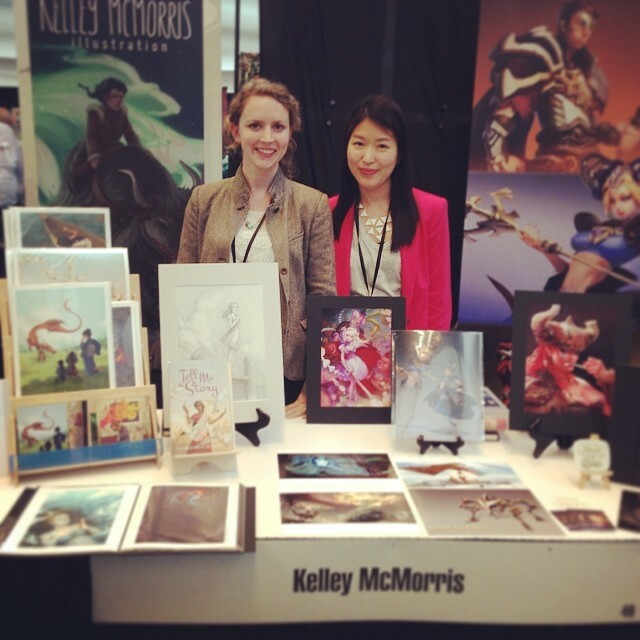 I manned the table by myself on Friday, then on Saturday my dear friend Anna joined me and we shared a table. Everything was much more fun with her around. We were able to switch off running the table and browsing the show, or bringing food and snacks for the other. Despite the fact that English is Anna's second language, she was better at making small talk with visitors at our table than I was. If you give something away for free, bring a lot of it. People will collect anything that's free. Every table had free business cards, many also had free postcards. I ran out of business cards on the last day. So if you're giving something away, bring at least three or four hundred copies. People like flipping through books. It's something they can interact with rather than just stare at, I guess. My art book was pretty popular (relative to the rest of my merch) and people spent time flipping through it and my portfolio. My most popular items were the postcards, followed by the art book, then the prints. My original pencils did not sell at all; in fact it seemed like people hardly even noticed that they were there. So that's something for me to consider; maybe I need to change how they were displayed. The money I made doesn't come close to covering the cost of the trip, but I'm hoping that if I continue to attend shows I'll start see some benefits. My main purpose was to simply get my name out there and to meet some cool people - which I did! I hope to go again next year. You are too sweet! I'm so glad we got to meet this past weekend and I look forward to chatting a bit online and maybe seeing you at a future show! As I mentioned in your last post, thank you for coming! It was nice to stumble across your work and find such amazing talent at Spectrum. I enjoyed talking with you and especially the great sketch you did for me (the japanese girl...that you just posted!). Thank you!!! If Cory Godbey bought anything of mine I think I'd be a blubbering fool. It sounds like it was a great weekend! Sales are not everything when you're just starting the convention scene. You'll get there! Haha! The only reason I wasn't blubbering was because I was concentrating on not peeing my pants in excitement. Thanks Annie! I'm glad that I got to meet you at Spectrum. Great post Kelley. Are you going to be at FantasyCon in SLC? Thanks Howard. No I'm not going to FantasyCon. I've only just started to look into going to cons this year, so I'm still getting to know all the possible ones to go to. Are you going/have you been to FantasyCon?